India local medical plants are usually planted as a tool for hedging plant. Shrub, 1-3 m tall, much branched. Woody stems, round, berbuku books, hair, green-brown color. Single leaves, opposite, elliptic to lancetnyh blade, the tip of the grounds and tapering, flat edge, dice the leaves are pinnate, second surface hair, 4-8 cm long, 1-3 cm in width, the color green or yellowish green. Flowers solitary or in pairs, in the armpits and the tip of the stalk leaves glandular hair Crown, the Crown of upper lip four shares, shaped, the color purple. Fruits of the medical plant are elliptic, 1.5 cm long, three-four lips, Brown. The seeds are small, flat, Brown in colour. Raw materials: leaves, roots, flowers and seeds. 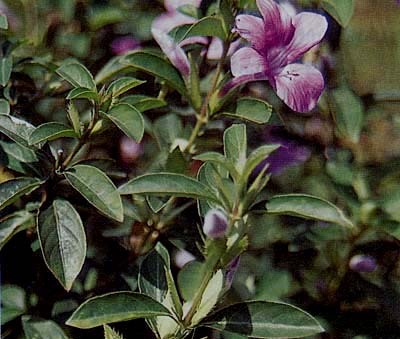 use: the leaves and roots due to overcome:-rheumatism and-cough. Flowers goes to overcome:-edema due to insect bites. The seeds are effective to overcome: poisonous snake-bitten. Example used the medical plant daun madu: 1. preparation of Rheumatism 1 handful of fresh leaves and launder. Whiting, add 1/4 teaspoon. Mash until blended, then lubricating the sore.